SSL Certificates are small files containing critical data that digitally connects a cryptographic key to an enterprise’s details. When SSL is registered on a web server, it activates the https protocol and enables secure connections between a web server and a browser. You can also boost your Google ranking by installing SSL certificate to your business website. This certificate comes in both paid and free version. On the other hand, Apache is a web server software which is widely used across the globe. The Apache Software Foundation develops and maintains this open source software which you can avail for free. Almost 67% of all web servers in the world runs on Apache. It is secure, fast and reliable. Furthermore, it is flexible to meet the requirements of different environments with its useful modules. If you are running a business for which you are using a web server, you must secure it with HTTPS protocol. This will offer maximum security for your customer’s data and improve your website’s Google ranking. 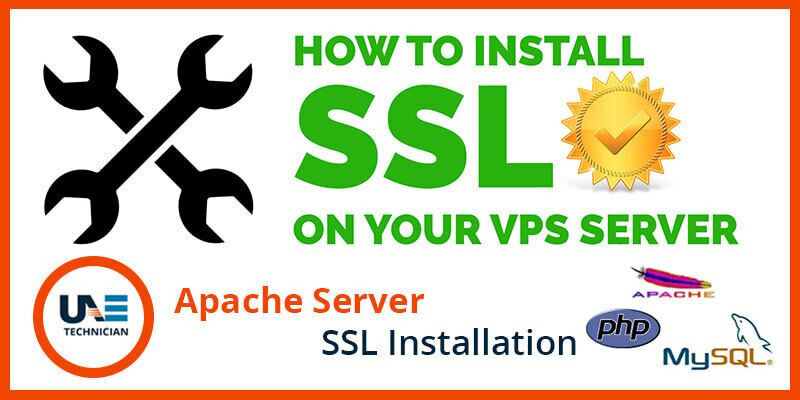 We at UAE Technician have a team of experts who can help you to install free SSL for Apache server. Connect with us via call, mail or chat to avail our expert guidance at a reasonable price. This certificate is essential for any business to protect the plethora of information exchanged between a computer and the destination server. Without this security, critical details of your customers such as credit card numbers, usernames and passwords etc. become vulnerable. Various cyber threats such as spyware, malware, spam, phishing etc., can attack and hack those details resulting in serious trouble for your customers. So, as a business owner, you should ensure the maximum security of your customer’s data by securing your web server with SSL certificate. To register SSL certificate in your existing Apache server in the proper way, you need to hire a trustworthy service provider. We have a team consisting of skilled experts who have years of experience in linking web servers with SSL certificates. They can assist you in the best manner to register SSL certificate in your existing Apache server for free. Our experts at UAE Technician undergo rigorous training at regular intervals which helps to enrich their technical knowledge. Furthermore, we collect regular feedback from our customers which helps to improve our service quality. Our charges are nominal and we always charge for the amount of work done by us. Avail the most reliable support for Apache Server by connecting with our professionals. We at UAE Technician have a helpline number: 042053349 at which you can call irrespective of time to solve any web server related query. Our experts will offer you thorough guidance at a budget-friendly price. You can also write an email stating your requirements and receive a call back within the next 24 hours. Additionally, you can talk to our experts in real-time about your queries via our live chat window during busy working hours. They will provide you with a quick response to address your queries regarding web server. Looking for cost-effective support for Apache Server near your location? Connect with us now and eliminate technical worries for good. We also provide SSL installation services.